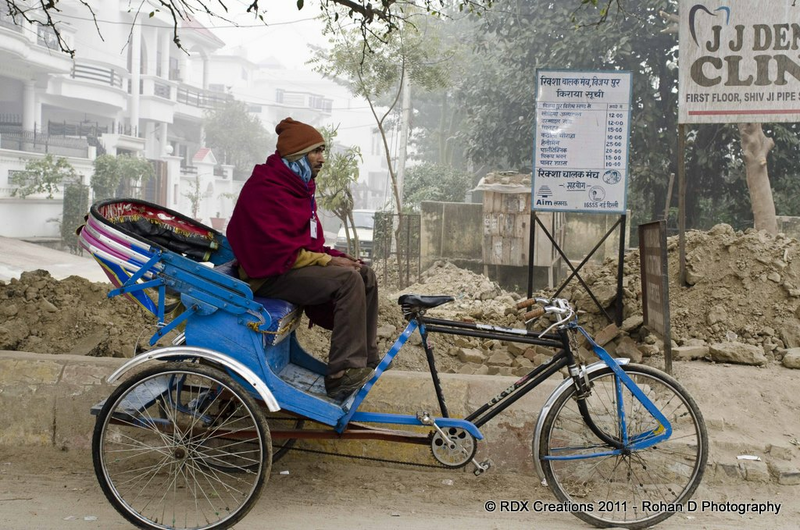 The word rickshaw comes from the Japanese word jinrikisha (jin = human, riki = power or force, sha = vehicle), which literally means “human-powered vehicle”. Rickshaws first emerged in Japan around 1868. 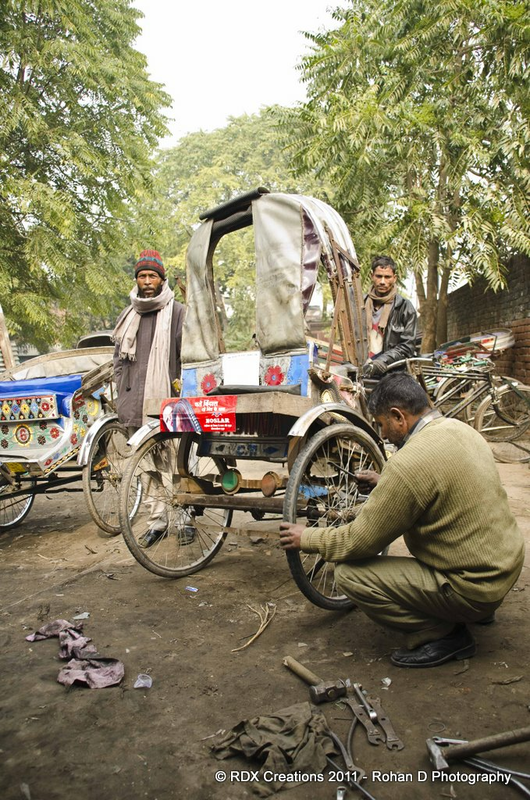 The word rickshaw originated from Asia where they were a means of transportation for the social elite. They soon became a popular mode of transportation since they were faster than the palanquins and human labour was much cheaper than the use of horses. 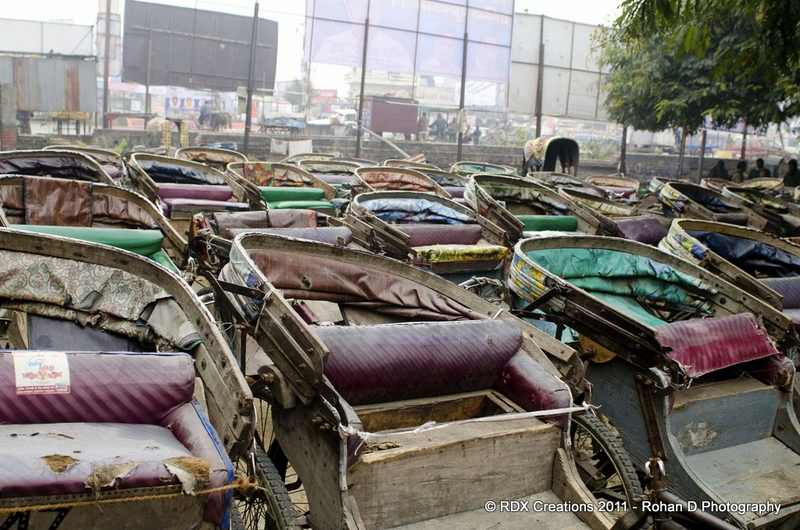 Sad but nothing much has changed since then Rickshaw pullers are still treated the same, no regard for human labour. 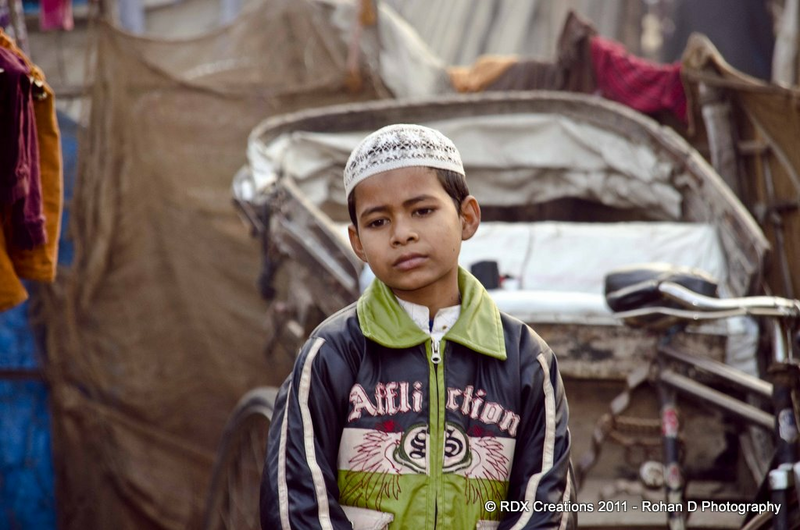 We call them rickshaw-pullers because back in the days there were only hand-drawn rickshaws. 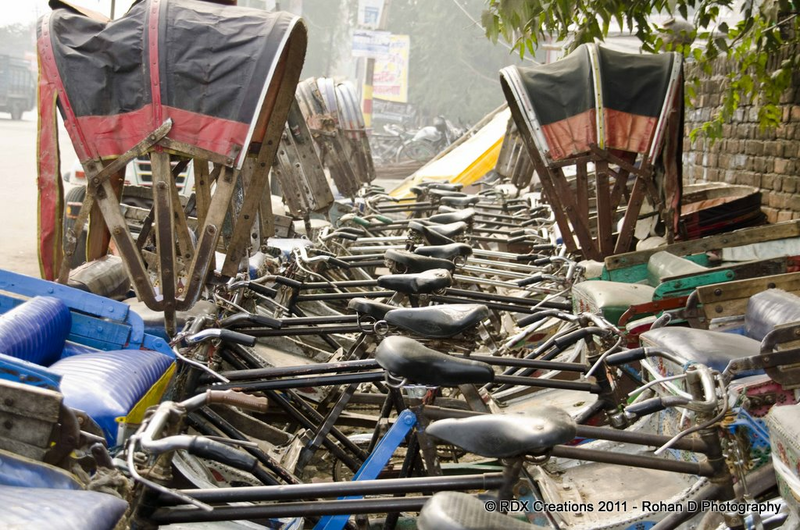 Now we find cycle-rickshaws which are comparatively more humane than the hand pulled rickshaws. 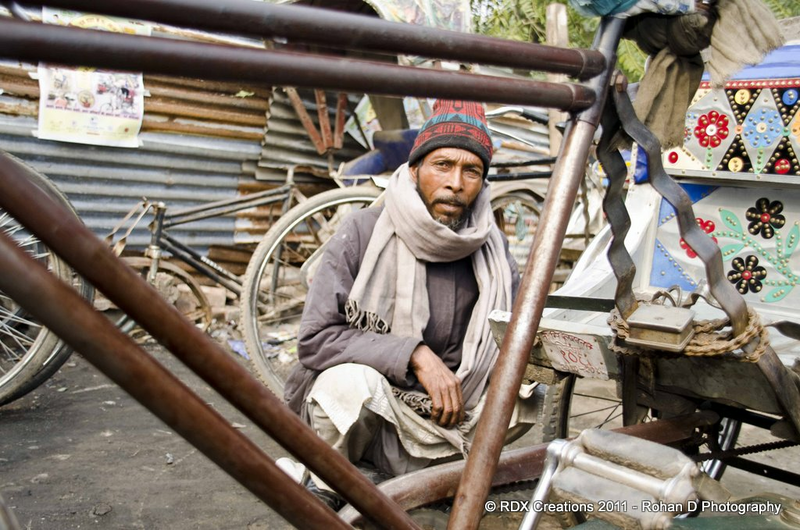 While on an assignment in Lucknow the city of Nawabs in Jan 2011, I had an opportunity to spend a day in the lives of people who have been our mode of cheap and efficient transport from decades "Rickshaw Pullers". 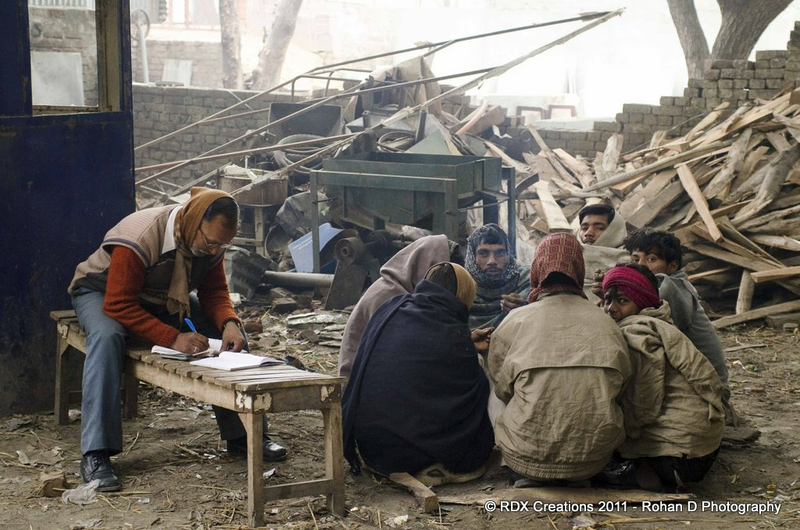 In the little time spent with them, I was able to establish that most of the Rickshaw pullers were migrants from other states hence did not have homes to stay so they find empty plots of land and make shelters for themselves. 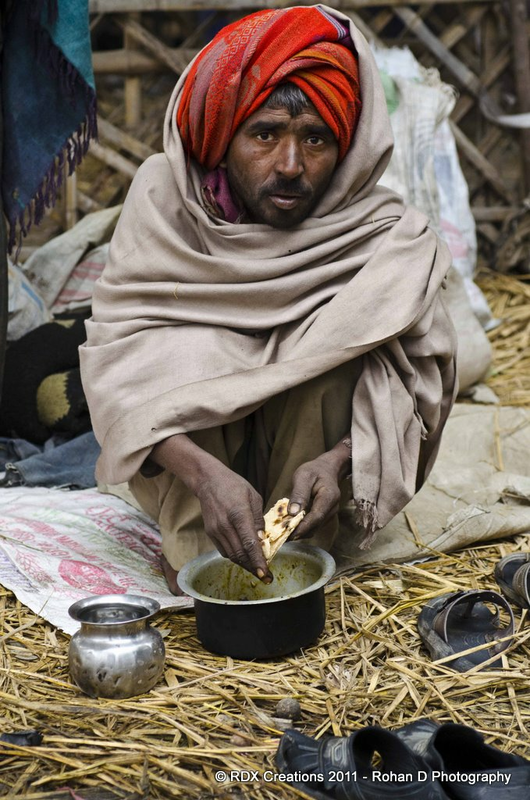 Its hard not to notice looking at the images below the degradation of human life and unbearable conditions these people live in while battling the elements of nature. An empty piece of land which they've converted into their home ! 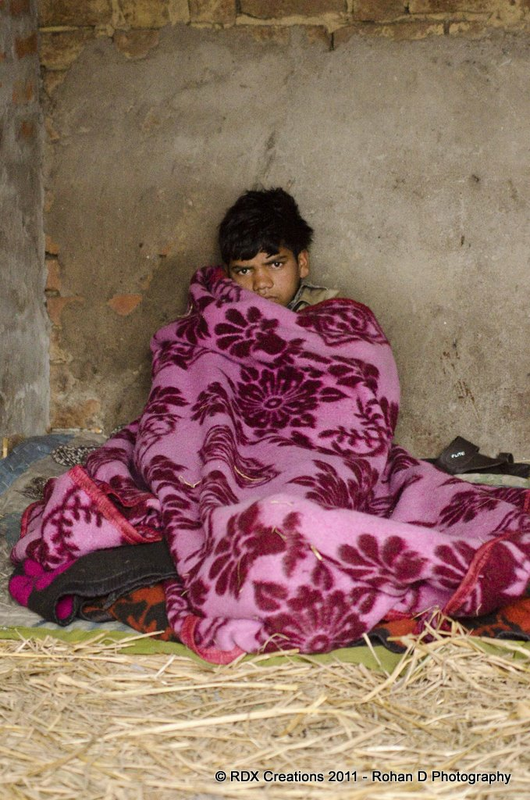 They use straw as mattress and insulation from the freezing ground and huddle up together to stay warm as the mercury falls to 1 deg. 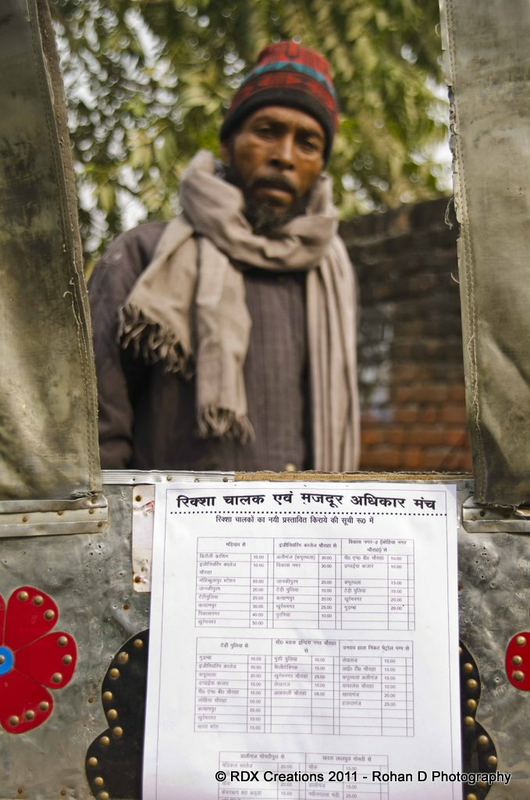 A rickshaw pullers son wakes up to an uncertain day and future…. 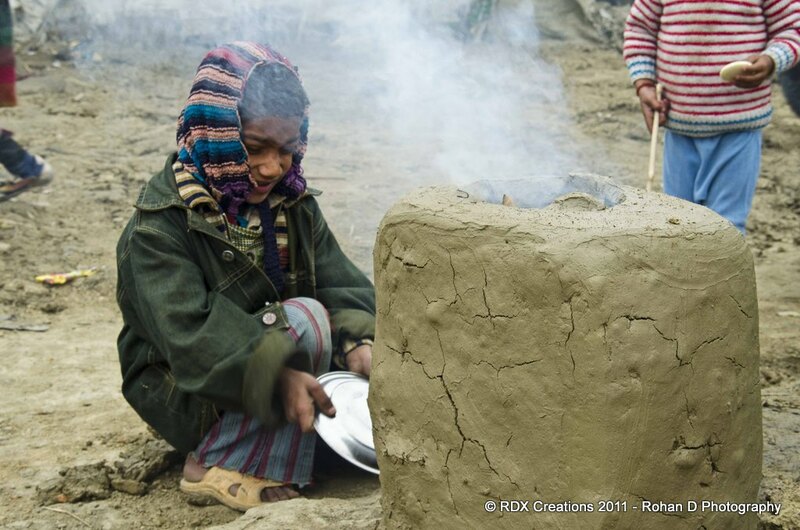 being migrants from other states and poverty stricken most of these children don’t receive an education but are used as child labour on various construction sites on daily wages. 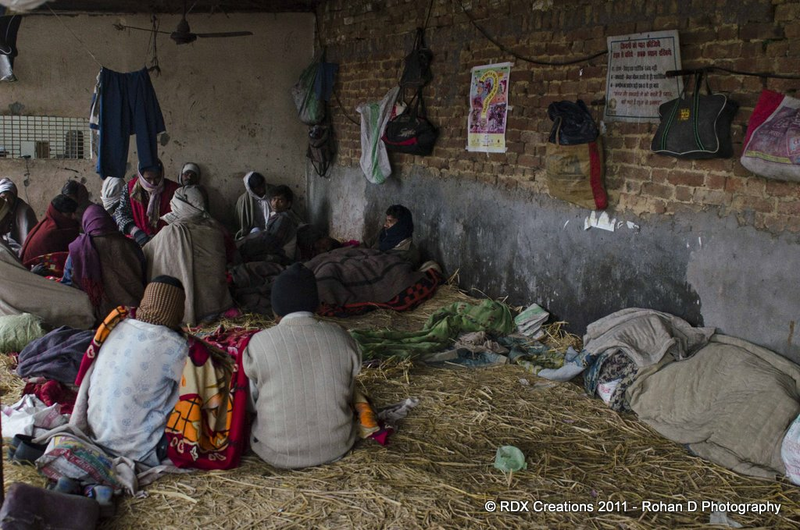 In Sanitary living conditions - What you see is their wash room ! Coping with the weather sitting around a fire to keep themselves warm ! 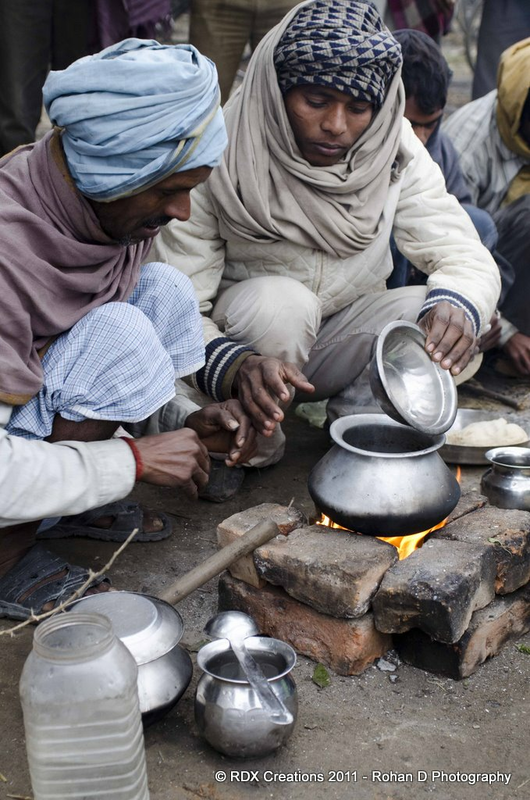 Preparing a meal of boiled vegetables and roti as they start their day, which could also be the only meal of their day. Cant haul passengers on an empty stomach. 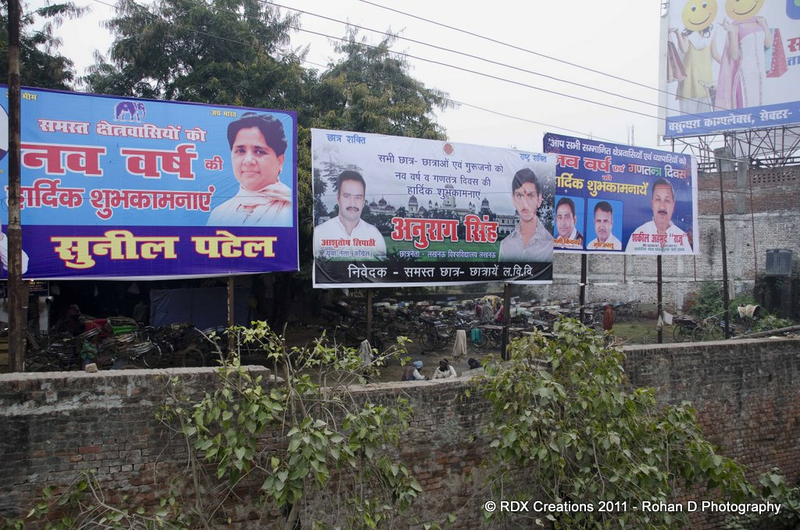 The irony is we have great leaders of our nation canvassing for votes right above the inhumane conditions these people survive in ….seems they are blinded by choice. Leaving for a hard days labour! 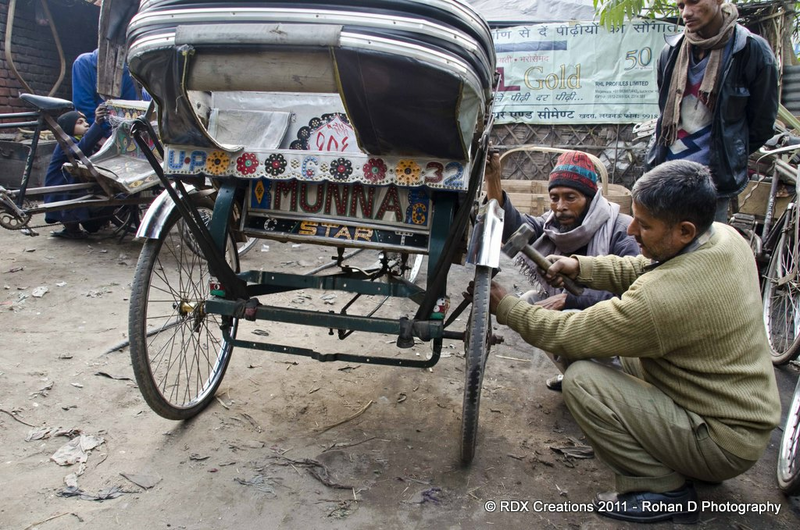 A Rickshaw repair shop at Indra Nagar Lucknow. The mechanic inspects after fixing the snag. 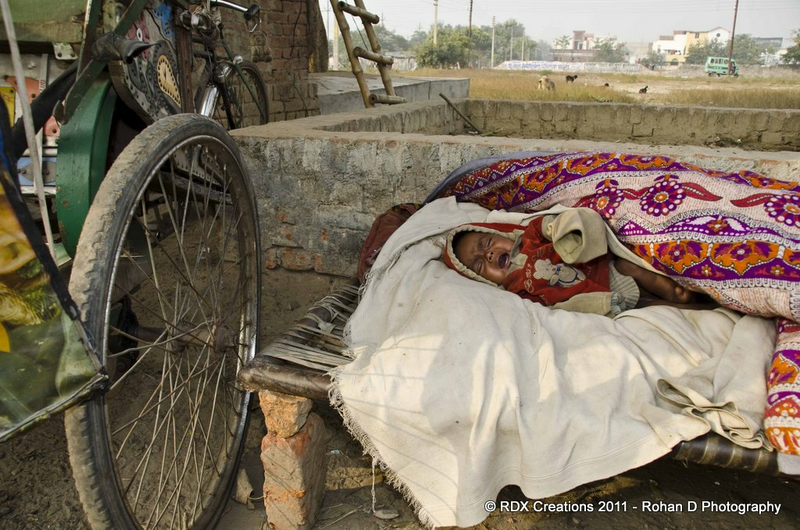 Waiting while the rickshaw gets repaired. 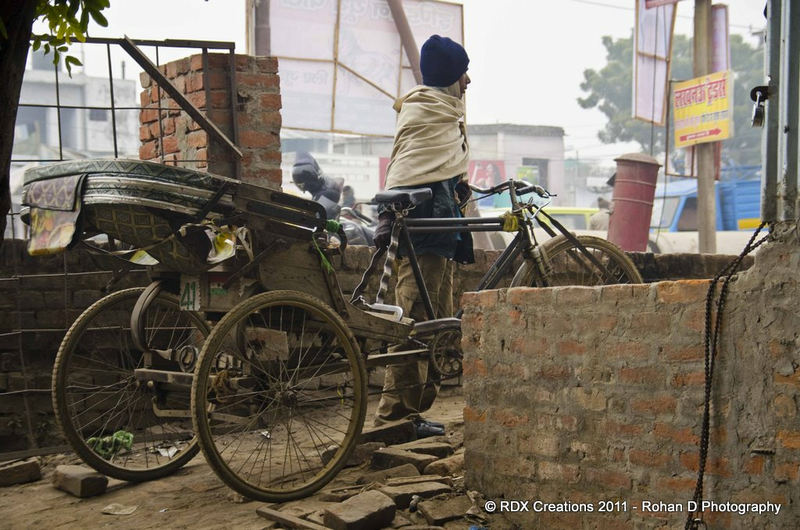 A rickshaw puller leaving for work also can be seen his wife and child, the contraption in the background that they call home. 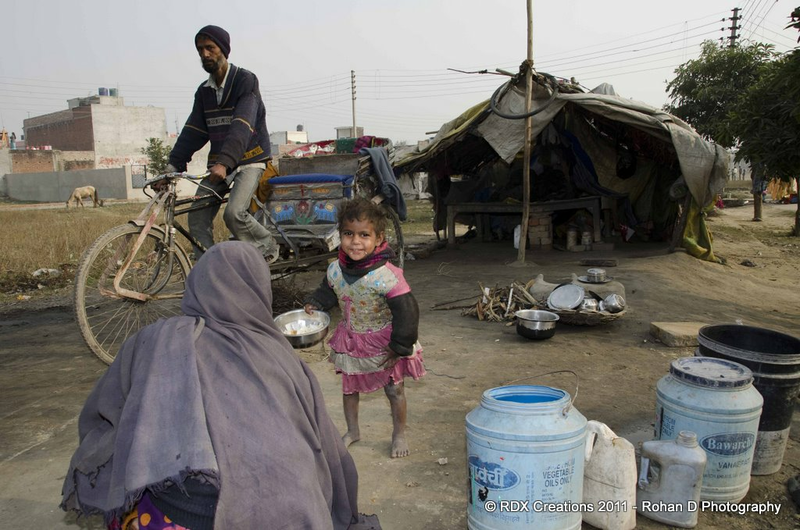 A child cries out for his mother while she is busy with household chores. 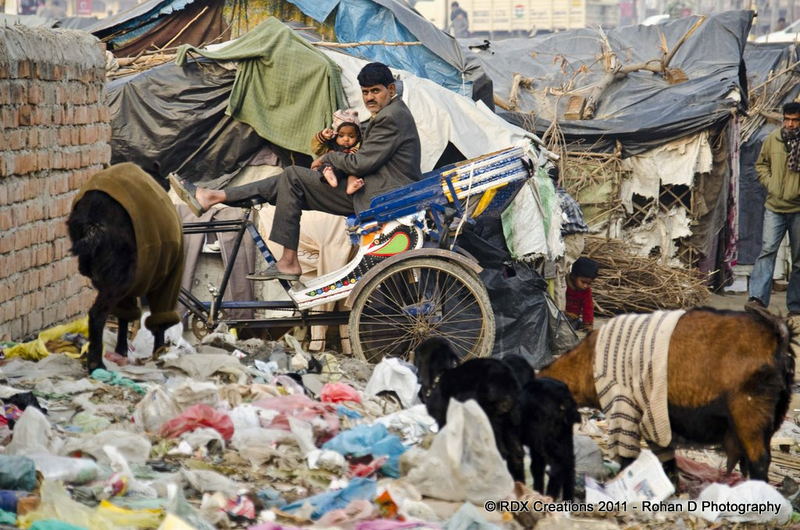 A rickshaw puller spends some loving moments with his child ..one can notice the insanitary conditions they survive in..
A boy lost in thought wonder what would be going through his mind. Like to quote Adam Smith: "Labor was the first price, the original purchase-money that was paid for all things. 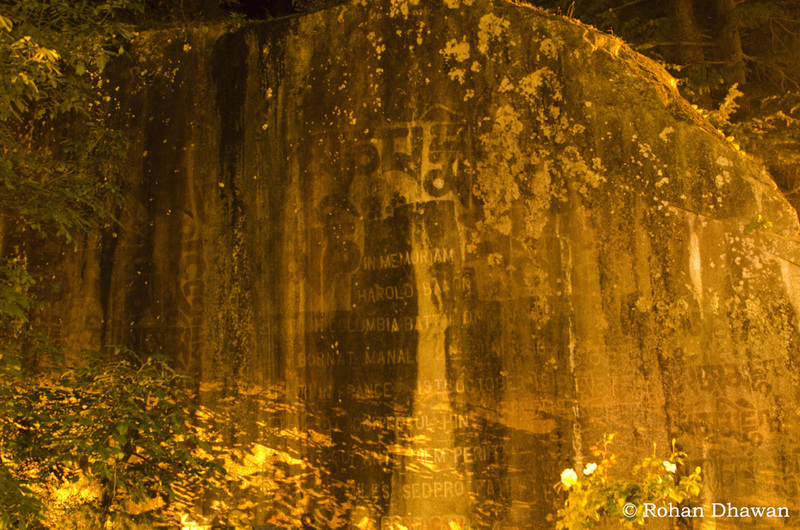 It was not by gold or by silver, but by labor, that all wealth of the world was originally purchased".